For those of you who love the convenience of Alexa built into your speaker, but aren’t as much of a fan of the Amazon Echo Speaker, audio giant Harman Kardon may just hold a new 'Allure'. The Harmon Kardon Allure boasts the manufacturer’s 360-degree sound, and has Amazon Alexa functionality baked in, negating the need for an Echo Dot (currently the favored way to extend Alexa to a decent speaker). The Allure also brings ‘ambient lighting’, which means it will glow pleasantly and react to both your voice commands and the music that you play through the speaker. 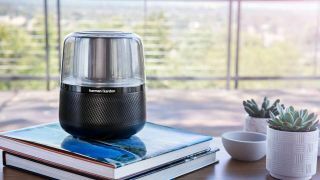 “We’re excited, to integrate with Amazon Alexa to deliver a beautiful speaker with astounding audio coupled with all the intelligent features of Alexa,” said Harman's Michael Mauser. The speaker has built-in far-field voice recognition - necessary for anyone hoping for Alexa to work properly - standard wireless Bluetooth streaming and will retail for around $299/£250/AU$400 when it launches in ‘Winter’ 2017.